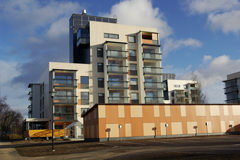 Kiinteistö Oy Kummatti`s renovation completed 51 apartments for seniors in size from 35 to 62.5 square meters in late year 2010. The properties are accessible, safe and equipped with taken into account the needs of older people, such as electronic access control, video surveillance and ”smart-lift”. All apartments are fully prepared to receive additional services, such as video phone. Presentation of senior housing can be found here pdf.